The Left controlling the top three social media platforms, Facebook, Twitter and YouTube, have started a war with conservatives. All three have been slowly clamping down on content they deem offensive. Yours truly for years has been warning about Facebook shutting down conservatives which is now in full effect. Many larger sites are now wondering why their content is not reaching their followers. This of course is Mark Zuckerberg’s plan to silence dissent because it played such a massive role with the 2016 election. Twitter has been at it for sometime as well, where it became so obvious they blamed a recent act, #TwitterLockout, on a technical glitch, but users know better. Many complain about the inability to retweet and share content, others suspended for no reason. YouTube has been at it as well, cutting off ads to many content providers, oddly most are conservative in nature. This has had detrimental effect on those who were actually making a living posting vids forcing them to ask for donations via Patreon or other services to stay afloat. 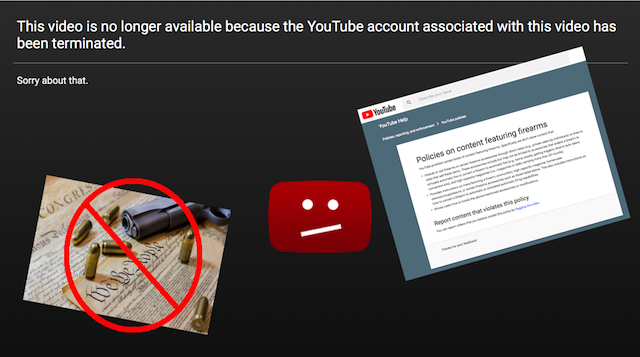 But now the company has taken a new step to more or less shut down.. purge all gun related channels and content. • Intends to sell firearms or certain firearms accessories through direct sales (e.g., private sales by individuals) or links to sites that sell these items. These accessories include but may not be limited to accessories that enable a firearm to simulate automatic fire or convert a firearm to automatic fire (e.g., bump stocks, gatling triggers, drop-in auto sears, conversion kits), and high capacity magazines (i.e., magazines or belts carrying more than 30 rounds). • Provides instructions on manufacturing a firearm, ammunition, high capacity magazine, homemade silencers/suppressors, or certain firearms accessories such as those listed above. This also includes instructions on how to convert a firearm to automatic or simulated automatic firing capabilities. Someone posting a how-to video on setting-up and running a reloading press is actually useful and educational. Yours truly reloads, and these types of videos are quite valuable for the hobbyist who is not reloading 1000’s of rounds weekly. Frankly, it’s literally a matter of life and death, but YouTube doesn’t care. 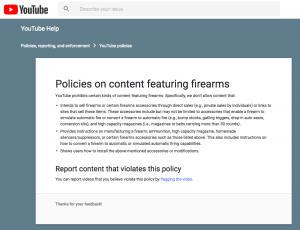 They think such information from reloading to assembling an ArmaLite rifle, to a review on a new grip, magazine, sight etc is responsible for mass shootings and could help criminals, evil doers and/ or terrorists, so they want to pull all the content. This of course has content creators, reviewers, and folks like yours truly scrambling to save as many vids as possible before the dreaded message appears that a video has been deleted. This is just another example of Leftists pushing their anti-gun agenda to the maximum. They’re going after retailers, sponsors, individuals, entire organizations (NRA) and now those who post videos on how to fix a weapon, or what they think of a new gadget. The First Amendment protects all speech including that which is offensive, but when posting said content on someone else’s platform that freedom is out the window. This is why the very content you’re reading is on this site vs on Facebook or some other platform. I OWN this site, I can do and say what I want and not worry about some admin being offended by my honest opinion and deleting this op! These social media companies are private they can make any rule they want. When they lose viewers and revenue over these purges we’re witnessing they’ll have to answer to their stockholders. That’s the key in dealing with them, is crushing them financially. But America doesn’t have the will to go that far otherwise STR Tactic #15 Corporate Squeeze would’ve gone viral. Boycotts do work the problem is people on the Right do not have the will to do what the Left does and punish those working against them! What we have now with Facebook, Twitter and YouTube purging conservatives is a massive example of putting all our eggs into one basket. Sadly super rich Leftists run all the big social media platforms while the super rich on the Right hoard their money, offer pats on the back and well wishes vs bankrolling new projects and ideas that offer an alternative (like the one I have to go after all three). Who knows maybe these three will finally come under federal oversight like radio and television did when they became far too influential on American politics and social issues. Don’t hold your breath. The best that can happen is someone finally offers a place where everyone is free to express their opinions and ideas without being in fear of deletion!